Today, 1.5 billion people live without electricity, a situation known as energy poverty. For them, life still moves to the patterns of the sun and the moon. Work and study mostly come to an end when the sun goes down. Cooking happens the way it has for centuries before – over smoky indoor fires that do no favors for lungs or life expectancies. Peter DiCampo has experienced these conditions first hand. Unlike others though, DiCampo, a highly regarded documentary photographer, chose this lifestyle. He lived and worked as a volunteer in remote northern Ghana for an impressive stint of about two years. DiCampo’s sacrifice, talent and compelling subject matter have yielded a beautiful collection of aptly titled “Energy Poverty Photography” and videos that document the difficulties of life without electricity. On the website for his long-term Life Without Lights project and in the video below, DiCampo eloquently conveys the way living without electricity impedes nearly every aspect of development for his neighbors in Ghana, from education to health and economic advancement. In Binika, Kurdistan, DiCampo learns, “the village pools their money to run a community generator one or two hours each day.” The generator cannot power heavy appliances or machinery. 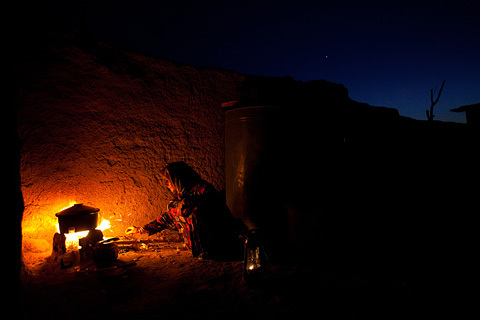 “While satellite dishes and televisions are cheap in the area, fuel for a generator is ‘very expensive.’” DiCampo’s image below shows a woman cooking by an open fire in Kurdistan. The evolution of DiCampo’s work makes clear that energy poverty reaches beyond the villages of developing countries. The lengthy economic downturn has created new classes of energy poor in advanced economies. In Solihull, England, Richard has, “gone four years without heat and dares not turn his lights on for fear of increasing the [severe] debt” to his energy company. Fortunately, some have taken up the cause to bring light and, with it, hope for a better future to the hundreds of millions of people like DiCampo’s subjects. The United Nations has declared 2012 the Year of Sustainable Energy for All. Below is just a small sample of organizations that are working to bring an end to energy poverty. o The Solar Electric Light Fund (SELF) helps implement sustainable solar energy solutions for villages, health clinics and schools in Africa, Asia and Latin America. SELF’s model calls for a village to take full ownership of the project scope and management. Families are trained to install, maintain and replicate their own solar systems, which they can pay for through micro-credit financing. SELF has collaborated with Partners in Health to bring solar power to their operations around the world. NRG Energy has joined forces with SELF to fulfill its $1 million commitment to the Clinton Global Initiative to bring renewable energy to Haiti. o Solar Sister is a woman-led organization that empowers women in rural Sub-Saharan Africa to run their own social enterprises by marketing attainable, low-cost solar energy products that bring “light, hope and opportunity” to those accustomed to a life of energy poverty. Solar Sister’s model enables women with little means to become entrepreneurs by providing a holistic package of working capital, business training and marketing support. Progressive companies have also demonstrated an interest in finding innovative solutions to the plight of the energy poor. Siemens’ sustainability site tells the story of Aly Bamba, a Kenyan fisherman at Lake Victoria who used to spend over half his income on fuel for dangerous kerosene lamps that attract fish to feed his family of eight. A solar-powered energy hub developed by Siemens’ OSRAM subsidiary enables Aly and his fellow fishermen to charge batteries that power lamps which are safe and reduce the fishermen’s costs by 30 percent. To experience more of Peter DiCampo’s Life Without Lights project and other work, check out his website at: http://www.peterdicampo.com. Visit the websites of SELF and Solar Sister to learn more about their approaches to bringing hope and opportunity to those who live without electricity and ways to support each organization’s worthy efforts.